The best thing about this beast bowl is the peanut sauce. You will literally want to just eat this sauce right out of the bowl – the salty, gingery, garlickiness of this peanut sauce is SO good. When you smother it on the marinated grilled chicken, the flavor combo is undeniably fantastic. 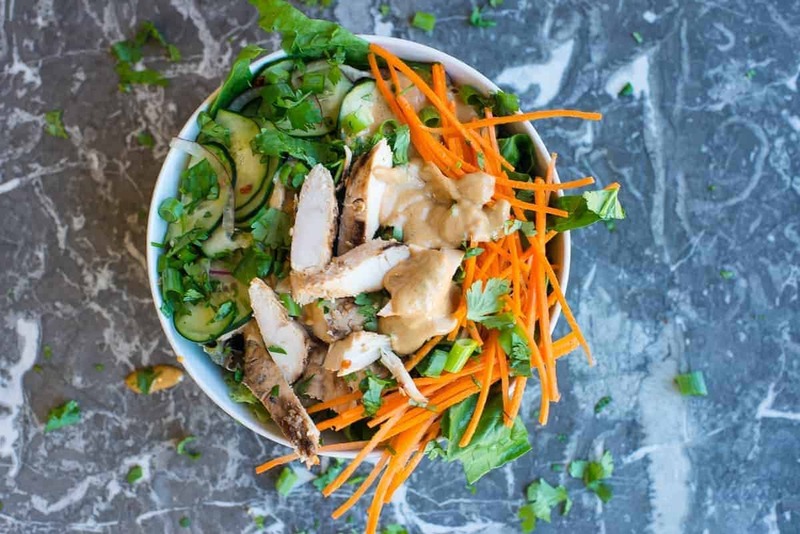 The Chicken Satay Beast Bowl is an awesome meal prep go-to. When I do my meal prep for the week I like to pick two different styles of Beast Bowls. That way I have a little variety. I have several different ways that I marinate the meat depending on what I am in the mood for. Once marinated, I simply bake it, or grill it. Because these tenderloins are all pretty similar in size, using this approach you can get two different styles of chicken cooked at the same time. So easy, right? Chicken satay is super easy to prepare – just throw all the marinade ingredients in a zip-lock bag, toss the chicken in and let it sit. Your chicken still is frozen? No problem! A shortcut that I use all the time is to toss frozen chicken directly into the marinade. If you do this, make sure to omit any extra water called for in the marinade recipe. Pro Tip: Prep similar things together. In this particular Beast Bowl, the chicken sits on a cucumber salad. This salad tastes best if allowed to be in the dressing a while. Lucky for us, the cucumber salad dressing is super similar to the marinade for the chicken. To save time and effort, I usually make the marinade and the dressing at the same time in two different bowls. This allows me to get the cucumbers and onions in the salad all prepped and ready at the same time as the chicken. The chicken then just gets tossed into its own bag of marinade, sealed and put in the fridge…next to the salad! I can usually meal prep a week’s worth of meals in about 2 hours. Start by picking two beast bowls. Then plan your proteins. You can easily grill a batch of chicken satay and Greek burgers at the same time or one after the other. Prep your sauces or dressings and store them in the fridge. Homemade is best, but if you don’t have the desire to make the particular sauce from scratch just find a healthy substitute. There are many brands on the market today that are leaving out the added sugar and opting for healthier real-food ingredients. Chop and store enough veggies to have on hand to fill up your beast bowls. There some basic veggies that I eat in almost every single beast bowl. You will find your favorite few greens. Maybe you like springs green, or you love a good red leaf lettuce. Find yourself a few basics and keep going back to the ones that work for you. We’d love to hear your feedback! What has been your favorite Beast Bowl so far? Do you have any Beast Bowl ideas? Leave a comment and let us know! In the meantime, sign up and make sure you get our Beast Bowl Build Guide – it is FREE! Also, keep your eye out for our Beast Bowl cookbook coming out later this fall. Juicy marinated chicken with peanut sauce. A bowl of veggies and an Asian cucumber salad. All the protein and veggies in a Chicken Satay flavored bowl or yummy! Add all ingredients for marinade in a shallow glass bowl or pan (or ziplock plastic bag). Grill or Bake @ 425℉ for about 20 minutes. Add all ingredients to a medium bowl. Whisk until smooth and well combined. Add water to get desired thinness. Thinly slice the cucumbers and onions. Using a mandoline or food processor makes quick work of this. Combine all of the ingredients for the dressing and pour over the cucumbers and onions. Add all of your favorite bowl fixin's. Add 3-8 ounces of chicken depending on your protein needs. Top with shredded carrots, cilantro, and green onions. Paleo Adaptable: Use almond butter instead of peanut butter. Vegan Adaptable: Use Seitan instead of chicken. Me and my kids love satay but for some reason never made it at home. I’m totally adding this to our rotation! Great meeting you at IFBC! Awesome. I hope you love it! It was great meeting you as well. BTW your blog looks great! I love everything about it.